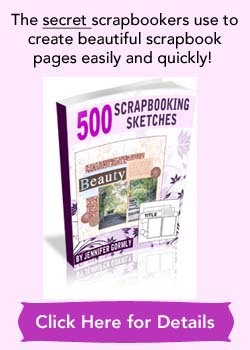 This scrapbooking idea is to shine the limelight on an item that you find indispensable in your life. It could be a gadget like your cell phone. Many people are finding the cell phone increasingly indispensable. It could be your laptop that you bring with you everywhere you go. It could be one single item or a bunch of items. It’s your choice what you’ll like to focus on in this layout. 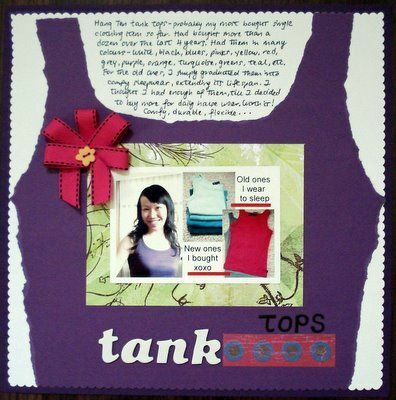 For me, I’ve chosen to scrapbook about my tank tops. Yup. Not just any brand, but this specific tank top by Hang Ten. I first bought them about 4 years ago. I wore them out, with jeans, with denim skirts, with shorts. From one, I accumulated more pieces of this tank top, in more and more colors. My sister Nicole did the same. She’s mostly into different shades of pinks where I grabbed a variety of colors. When these tank tops got too old to be worn out, I graduated them into sleepwear and stopped buying new ones. Go dig out your indispensable item or items, take some photos and start scrapping away! 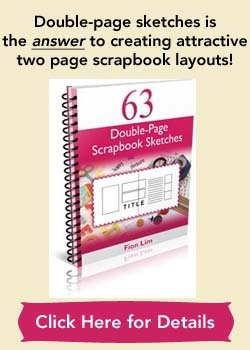 Remember to browse through this site for more free scrapbooking layouts! Supplies used: Cardstocks – Bazzill Basics and The Paper Company; Patterned papers – Basic Grey Urban Couture “Garbadine”, Brenda Pinnick Designs “Paper Confections”; Hot pink ribbon embellishment – from stash; Alphabet stickers – American Crafts “Thickers – Chipboard”; Pens – Zig Memory System “Dotta-Riffic”, Zig Memory System “Millennium”, Scallop-edged scissors – Carl CarlaCraft.